If two players have exactly the same number of points in the ATP ranking, what further criteria are used to determine which of them will be higher in the ranking? I am aware of the fact that this is not very probably to happen among top players, where the point differences are larger, but this is bound to happen for players with lower rankings and less points. 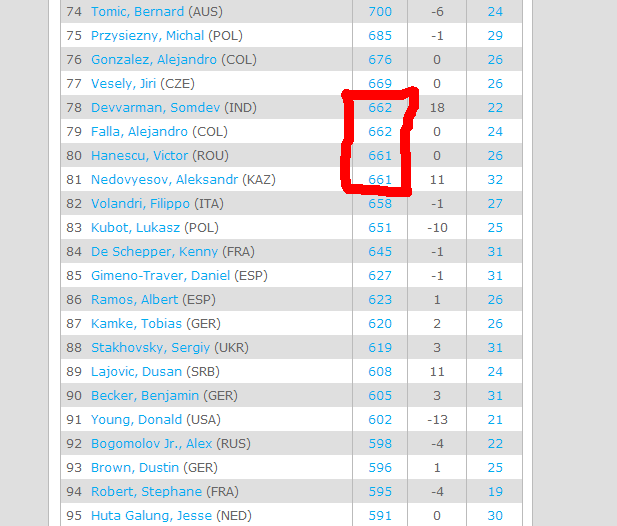 For example, in the current ATP ranking the players number 78 and 79 have the same number of points (662). So do the players ranked 80 and 81 (in this case, they have 661 points). The 2014 ATP Official Rulebook, 9.03 (Emirates ATP Rankings), Section E lists three different tie breakers in the event that players have the same total number of points. In the tie breaker, Devvarman has 195 points, and Falla has 155 points, so Devvarman is currently ranked ahead of Falla. Not the answer you're looking for? Browse other questions tagged tennis ranking atp tie-breaker or ask your own question.